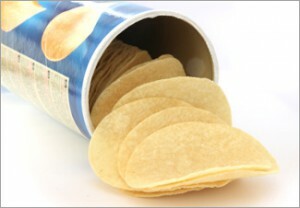 A customer requested us to manufacture a belt that gives stackable potato chips their recognizable uniform concave shape. As the belt is used in an application with direct-food contact it needed to be manufactured in compliance with the latest food safety requirements for food processing equipment, such as FDA, GMP and 1935/2004/EC. Twentebelt engineered a stainless steel frame that features a row of perforated and concave-shaped elements. A multitude of those frames is assembled onto a chain which makes it suitable for the mass-production of the widely popular stackable chips. Stackable potato chips are made from a mixture of ingredients such as potato flakes, water and corn starch that are mixed to create a potato-dough. This thin dough allows for easy manipulation of the shape. However, the thinness of the dough also posed an engineering challenge as the belt structure needed to be designed in a way that secures that the chips release easily and reliably in a uniform shape and to exact specifications. This means the solution needed to make sure that the chips stay in the right position to exactly align with the molds. Twentebelt’s engineering team developed molds with the recognizable concave shape out of high quality stainless steel. The molds feature a perforation pattern to allow airflow running through the holes for cooling purposes. The perforations also ensure that the product releases easily from the belt. Our team paid special attention to the way the molds are assembled on to the frame. Many traditional systems require the molds to be welded on the frames which poses potential breaking points and decreases the ease of maintenance. Therefore, the team engineered a solution that mechanically interlocks the various molds into place. As all the different parts are precision-engineered and manufactured from the best materials, a long and reliable lifespan is guaranteed. As the concave molds can be replaced easily and, as the structure is designed to have great hygienic characteristics, maintaining this strong and reliable belt is easy and cost-efficient. The belt is manufactured out of the best materials and customized to suit the specific installation. As there are no welds, this belt performs reliable and will have a long service life. As the solution offers extreme precision in terms of regularity in cutting and molding, the chips do not misalign in the fryer making sure your production is effective and efficient. The solution enabled our customer to have an effective and efficient production process. By constructing the molds and frame in a way that almost completely eliminates the risk of chips that are misaligned our belt made the installation perform more reliable. As replacing the different parts of the solution is an easy process we allow our clients to maintain their installation without needing outside consultants.